A research group led by assistant Professor Taichi Goto at Toyohashi University of Technology has, for the first time, demonstrated stop bands that prevent propagation of specific frequency components of forward volume spin waves. These are transmitted through magnetic insulators without the flow of current, and could be applied to the next generation of integrated circuits (ICs). Furthermore, among the spin waves that have been confirmed, forward volume spin waves are the most suitable for information transmission in IC chips, and there are high expectations for their application. However, until now, noise in forward volume spin waves was large, and the stop bands, which are among the basic physical phenomena, could not be observed. In this demonstration, a magnetic insulator was combined with metal to suppress the noise in forward volume spin waves, and the expression of stop bands was confirmed experimentally. This research was jointly conducted by Assistant Professor Taichi Goto, Ph.D. student Kei Shimada, Associate Professor Yuichi Nakamura, Professor Hironaga Uchida, and Professor Mitsuteru Inoue of the Toyohashi University of Technology. Additionally, the samples used for the experiment were prepared under a joint research initiative with Shin-Etsu Chemical Co., Ltd.
Due to increases in energy density accompanying increased integration, chip temperatures have become high, causing defects. 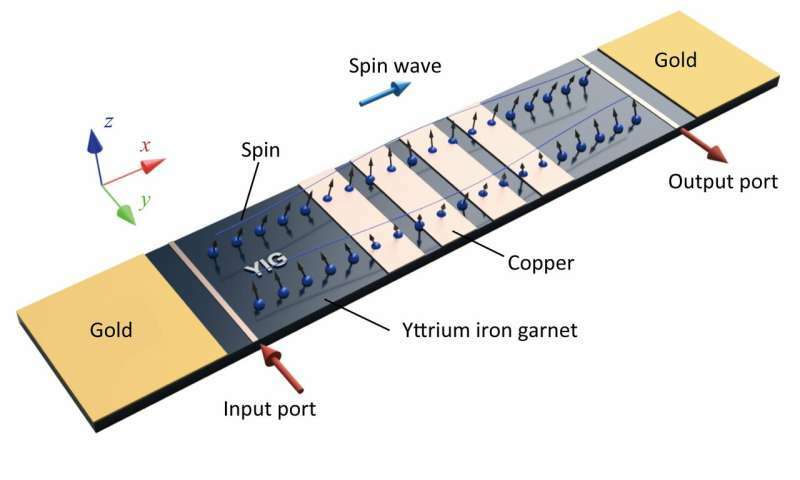 Therefore, the development of spin wave IC chips that can process information by transmitting spin rather than electrons would greatly reduce the generation of heat. Specifically, spin waves traveling through magnetic insulators have the advantage of low energy loss and long-distance transmission. Furthermore, among the spin waves whose existence has been confirmed, forward volume spin waves that transmit in all directions are said to be most suited for ICs because they can be wired diagonally or in curved shapes as well as linearly. On the other hand, these forward volume spin waves are noisy, and several fundamental spin wave phenomena have not yet been demonstrated. Demonstration of these fundamental principles is indispensable for the development of IC chips and has become an important issue. Now, a research group led by Taichi Goto of the Toyohashi University of Technology reports that they combined a yttrium iron garnet (YIG)—an oxide single crystal well known as a magnetic insulator—with two metals (gold and copper) to suppress noise. 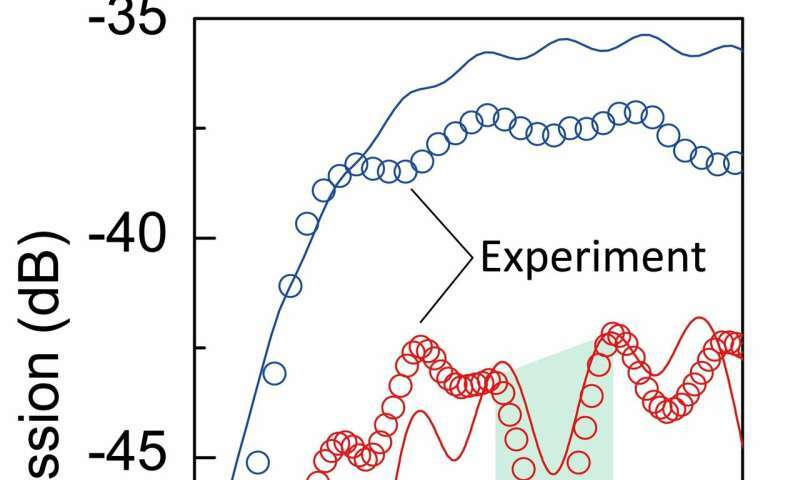 Through this approach, the research team was able to confirm the expression of stop bands in forward volume spin waves experimentally for the first time. In this research, they prepared a system that could simulate the propagation of spin waves using a three-dimensional model (Figure 1) with the same scale as real spin waves. Using this system, a sample structure was determined where noise was small and in which stop bands, which are one of the fundamental spin wave phenomena, would be expressed. A stop band does not allow spin wave components of a specific frequency to pass through, and stop bands are also expressed in other waves such as electromagnetic waves including light. Next, samples were placed as closely as possible to the simulation. Figure 2 shows a sample prepared using materials from Shin-Etsu Chemical Co., Ltd. 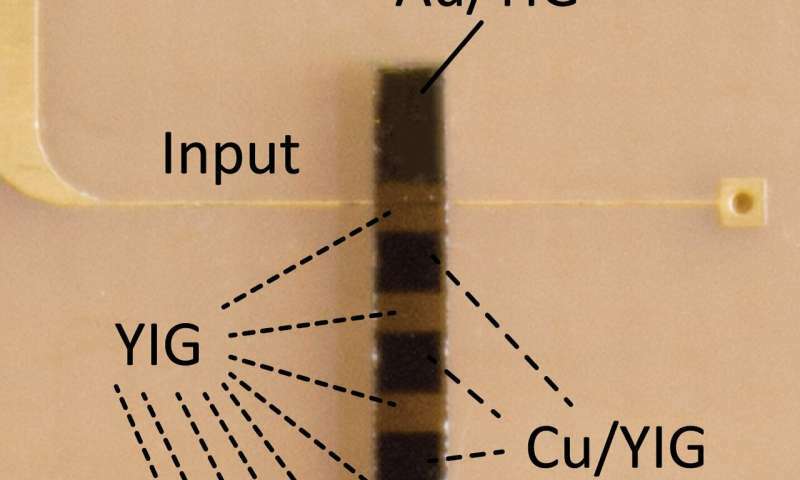 Both ends of the yttrium-iron garnet (which was processed into a wire shape) were covered with gold film to suppress noise generation, and by arranging a copper film in stripes like a pedestrian crossing, the research team tried to hinder the propagation of specific frequencies. Spin waves of various frequencies were passed through this sample and the transmission characteristics were measured. As a result, stop bands were expressed as shown in Figure 3. By comparing these with the characteristics of samples without stripe-arranged copper, the researchers observed that the expression of stop bands is due to the stripe-arranged copper. Also, the experimental results and the calculation results are in good agreement. The results can be predicted by simulation before experiment, leading to the potential for efficient spin wave IC development. The promising results of this research can be used for applications such as spin wave filters in spin wave IC chips in the future. In addition, they can also be used to slow down the transmission speed of spin waves and to control the direction of travel, contributing to the development of smaller chips capable of more dense information processing.